This gift set is beautifully boxed in a premium quality Chuao signature gift box and tied with a red fabric ribbon. All bars have been produced using Non-GMO ingredients and crafted with Fair Trade Certified cacao. They free of artificial preservatives, sweeteners, colors, flavors and hydrogenated fats. Firecracker: Sea salt, a dash of chipotle and popping candy crackle in dark chocolate. Cinnamon Cereal Smooch: Scrumptious cinnamon toast cereal spooning in milk chocolate. Pop Corn Pop: Inspired by that familiar flavor you love, with a surprising POP in milk chocolate. Honeycomb: Luscious amber honey, caramelized into crisp bits and enrobed in dark chocolate. Salted Chocolate Crunch: Crunchy, toasted breadcrumbs dusted with sea salt and swirled in dark chocolate. Sweet & Salty: A touch of sea salt swirled in creamy milk chocolate. Oh My S'mores: Mini marshmallows & crushed honey graham crackers reunite in milk chocolate. Pretzel Toffee Twirl: Crunchy mini pretzels and buttery toffee dance in dark chocolate. Ooh Ahh Almond: Crunchy whole almonds, kettle cooked in sugar & sea salt, delight in dark chocolate. Gift Measures 8" x 8" x 2.5"
Award-winning Master Chef Michael Antonorsi's family has roots in the cacao producing fields of Venezuela. 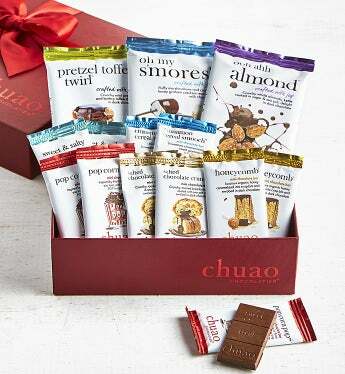 He trained in France and then founded his company, Chuao, in Southern California to create intensely delicious and uniquely American chocolate combinations like Oh My s'mores, Cinnamon Cereal Smooch, and Ooh Ahh Almond. WOW Chuao!